The Grover Pro Percussion T2/BC 10" Double Row Tambourine features Beryllium Copper tambourine jingles, double mounted premium white skin head, captive pin system, staggered jingle slot configuration, solid hardwood shell, and reduced width grip. A free tambourine bag is also included. 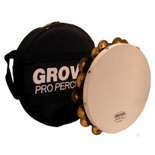 Beryllium Copper tambourine jingles were first developed by Grover Pro in the 1980s. This rare alloy is chosen by players who want a rich texture with a balanced blend of both bright and dark overtones. In the right hands, this tambourine will create a lush, signature sound profile. This is the tambourine of choice for many professional orchestral players. High quality instrument with a great sound! This is by far my favorite tambourine of all time. The response and sound is classic. It does everything a silver jingle tambourine can do and then more. Without a doubt, the single best tambourine I have ever played on! Killer sound at any dynamic level. Especially great for players like me who are into darker sounds. You will not regret purchasing this fine instrument! This is a world-class tambourine. It's worth every penny. That sound is to die for. One thumb roll, and I was hooked! 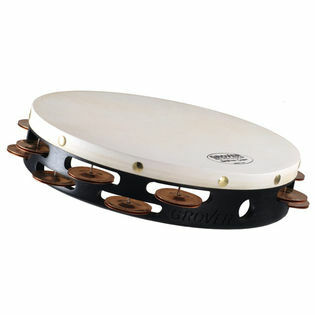 This tambourine sounds very rich and warm; but, if you're skilled enough, you get get bright sounds from it as well. It's also worth your while to collect the Grover tambourines because of the wide spectrum of sonorities possessed by these instruments. Nothing comes close. This tambourine is beautiful. The tone is very crisp and cuts great through the orchestra (perfect for "The Arab Dance"). It is mountable, sturdy, and the bag that comes with it was better than I expected-it actually has a little padding and the zipper is of decent quality. I am 100% satisfied.